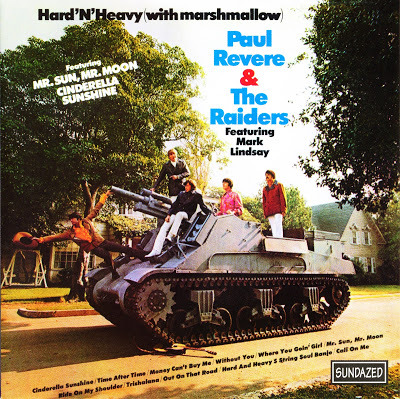 By the time of Paul Revere & the Raiders recorded Hard 'N' Heavy late in 1968, Mark Lindsay and Paul Revere were the only remaining original members of the band -- yet, surprisingly, this album consisted entirely of band originals, which is a pretty daring move for the first long-player featuring a new lineup of any band; even more amazing is that it's all good music. Bassist/guitarist Keith Allison, in particular, proved himself a special asset to the group throughout this album, not only with some very ballsy playing but three killer hard-rocking songs (co-written with Mark Lindsay) -- the Stones-like "Time After Time" and "Out on That Road," and "Without You." These alternate with Lindsay's smoother, generally more pop-oriented solo originals, and some competent, even catchy songs written by guitarist Freddy Weller and drummer Joe Correro. Lindsay's "Cinderella Sunshine" is the highlight of the album, appearing on the 2000 Sundazed Records reissue in both its album incarnation and its shorter, punchier single version. There's also an uncredited 16th track, "Everybody Loves Swingy," written for a Mattel doll, that's one of the most infectious rock & roll numbers ever cut by the band. Its presence also spotlights a conundrum that the Raiders faced in 1969 -- it was a sign of just how much this band liked to make music that people could hum and dance to, and didn't care for the "counterculture," the soon-to-be Woodstock Nation, and other touchstones of late-'60s credibility; it might have been a sign that this band was never going to get with it, as far as rock credibility in the late '60s, but heard today, the "Swingy" jingle seems poignantly innocent and honest, as well as being a catchy little song. The sound is, as usual for Sundazed, impeccable.